Inbound messages arriving on that GSM modem connection will be associated with this phone number. For 2-way SMS applications, the phone number is included in the @@Recip@@ parameter. Additionally, all inbound messages arriving on this interface can be queued for delivery to an SMPP Client account that uses this gateway as its SMPP Server. When a sender address is included in a message submitted to the gateway for delivery, and the sender address matches the configured phone number for a particular GSM modem connection, the gateway will ensure that the message is sent via this GSM modem. “Routing Options” are available for all SMSC connections defined to the gateway. For SMPP, UCP/EMI and HTTP connections, the “Routing” group of options is displayed on the standard configuration dialog. For modem connections, a separate dialog is displayed when “Properties” is selected for the connection. If “Support any outbound message traffic” is checked, this connection is available to route any messages, unless the recipient of the message appears as a “Preferred SMSC Connection” for another connection. If “Support any outbound message traffic” is not checked, this connection will only route messages when the recipient of the message appears in the “Preferred SMSC Connection” list for this connection. The “Preferred SMSC Connection” list specifies one or more patterns to match to determine if a message should be routed by a particular connection. Patterns consist of a phone number string, and can include the wildcard characters “*” and “?”. The “*” character matches any number of characters, and the “?” character matches any single character. When a pattern is defined on a preferred connection list, it means that any messages to recipients that match this pattern will be routed ONLY by this connection (unless another connection shares the same preferred connection pattern). In the example above, the connection will route any messages to recipients in the “+44” country code (because “+44*” is on the preferred SMSC connection list for this connection). Also, this connection will route messages for any other recipients where the recipient does NOT match a pattern on the preferred list for any other connection. In the example above, any other defined connections would not route messages for recipients in the “+44” country code, unless “+44*” was repeated on the preferred connection list for another connection. 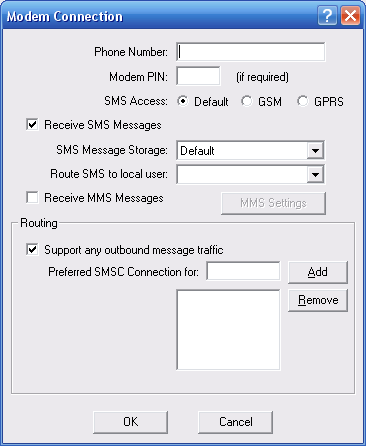 Additional information on the logic that NowSMS uses to decide how to route an SMS message can be found in the section titled SMS Message Routing Logic.